DUE TO LACK OF INTEREST, WE ARE NO LONGER SUPPLYING "PURIMUFFLERS" OR "CATALITIC" TYPE MUFFLERS . 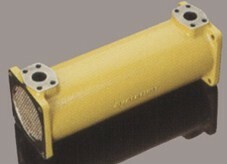 NOTE IF YOU ARE IN NEED OF A STANDARD TYPE FORKLIFT MUFFLER, PLEASE CALL WITH YOUR PART NUMBER. THANKS!! "CURRENT SPECIALS & NEW ITEMS"
"FINAL DRIVE BEARING & SEAL KITS"
"NEW - LED FLOOD LIGHTS FOR TRACTORS AND FORKLIFTS"
More links to Mufflers and Exhaust parts ! "NEW - LED LIGHTS FOR TRACTORS FOR ROAD CONSTRUCTION EQUIPMENT"
Quality Aftermarket and Surplus Caterpillar Parts. Backed up by the best warranty you can find on replacement mufflers and exhaust parts. Ask about other quality replacement parts available. Manifolds, Rebuilt and Surplus Turbos, Elbows, Stacks and more. NEW PARTS LEFT OVER ? E-MAIL US ABOUT BUYING YOUR NEW SURPLUS PARTS. Cat exhaust specialties in addition to mufflers include, exhaust manifolds , exhaust elbows , turbochargers , turbo couplings , muffler stacks , clamps and rain caps. We sell new replacement parts for loaders, dozer, scrapers, graders and industrial generator sets. When you need to buy parts in a hurry, let us know and we'll expedite your order as quickly as possible. Contact us for non-caterpillar parts as well. There is a good chance we can locate new surplus , used, or rebuilt parts for your application. Quality manufactured mufflers for Cat equipment. Up to 2 year warranty. ***** CALL 888-286-8827 FOR PRICE and Availability ***** We accept Visa Mastercard Discover and AMEX. *All manufacturer's names, numbers, symbols and descriptions are for reference purposes only, and it is not implied that any part listed is the product of these manufacturers.